Claude Goudimel was one of the most important French composers of the XVIth century. He composed a polyphonic four-part version of the 150 psalms in the Geneva Psalter for singing at home. This version was very successful and it is still used today. 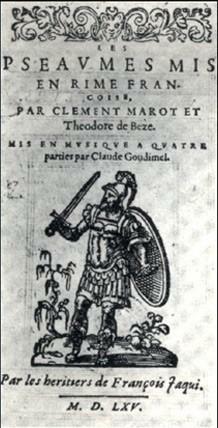 Claude Goudimel or Godimel was born in Besançon around 1520. We know that he was a university student in Paris in 1542. He took up a job as a proof reader for the printer Nicolas du Chemin, later becoming his associate. He settled in Metz around 1557. In 1560 he was converted to Protestantism ; he had a great interest in the text and music of the Geneva Psalter. He was assassinated during the Saint-Barthélemy massacre in 1572 and his body was thrown into the Rhône. He wrote a great deal of music : masses and motets for the Catholic Church but also many non-religious songs. He set Ronsard’s poems to music as well as an ode to Michel de l’Hospital. One often speaks of Goudimel’s psalms. However, he did not actually write the music of the psalms himself, rather, he wrote polyphonic versions for four or more parts. It is true, though, that his simple four-part harmonization, which enabled one to have a better understanding of the text (known also as the note for note method) was so successful that the other versions were used less and less. 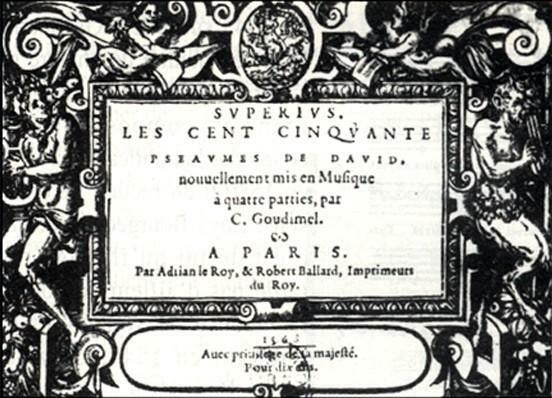 He was indeed the only composer to have harmonized the entire Psalter, that is to say, the 150 psalms written in verse by Clément Marot and Théodore de Bèze. Goudimel’s other polyphonic versions (decorative counterpoint or motet for three to eight parts) are only sung by professionals and can still be heard in concerts today. All these polyphonic versions of the psalms were for private use. In the XVIth century, psalms were sung in unison at church. Goudimel explained clearly in the preface of his Psalter that “they (the psalms) had been composed, not to be sung at church but to enable the faithful to rejoice in God, especially in their own homes”. Calvin himself also advocated the singing of psalms at home, in the bosom of the family. Goudimel’s psalms have always been very successful : they have been sung throughout the history of Protestantism, even in times of persecution and they are still sung today.